Eyebrows frame your face. Whether you want a new shape, colour or just want them to be neat and tidy – we have a range of brow services tailored for you. Defined, perfectly sculpted, arched and groomed? Check! Get the most gorgeous bombshell brows ever! Services including: brow gossip, brow tint, HD shaping, and finishing with luxury products and complimentary brow makeup. Eyebrow tint that makes your brows and eyes standout from a mile away! Choose for your brows to be from light and dark shades of browns, grey or black. Eyebrows too dark? 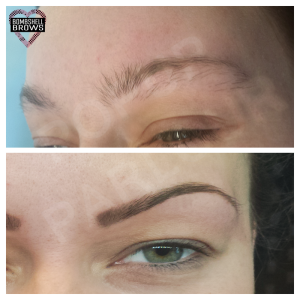 Have your brows lightened to get your perfect eyebrow shade. We always have offers on all our treatments. Make sure to keep coming back to Popup Parlour for all your beauty needs. Frequent eyebrow wax is a must.